I decided to paint some skeletons for my next set of practice miniatures. 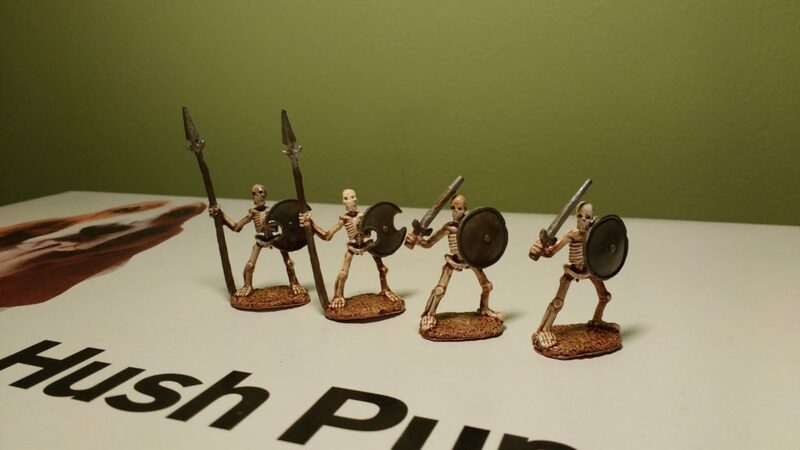 I had read on several websites that monochromatic miniatures like skeletons respond very well to the DIP Method. These skeletons were, no surprise, part of the massive pile of miniatures I got through the original Bones Kickstarter. The skeleton closest to the basset hound was the first I did and it was the first miniature that I attempted a wash on. Washing is a technique that I’ll detail in more length later but basically amounts to using thinned paint to add shading and detail. In this case I bungled it, making the miniature far darker than necessary, but I had figured that this was a safe miniature to practice on. The remaining three miniatures were solely shaded using the DIP Method and I think that the results are great considering the amount of time I spent on this skeletons (it was not a lot).